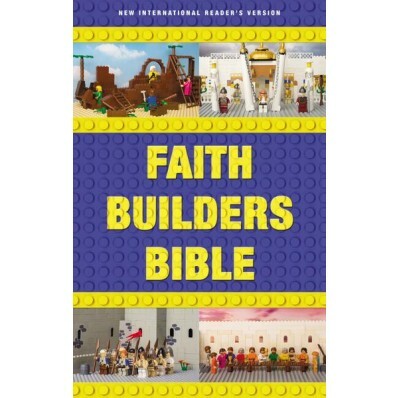 The Faith Builders Bible, NIrV uses the popularity of brick-building pieces to engage children with the Word of God. Includes 24 full-color pages of illustrations plus the complete New International Reader's Version (NIrV) of the Bible in a very readable font size. Faith Builders Bible by Zondervan is adorably cute! I absolutely love the little brick-building creations throughout the Bible. It certainly adds a little fun to reading your Bible. My kids love reading their Faith Builders Bible and I've even caught them playing with their Legos to recreate some of the scenes in this Bible. I also love that it contains large print making it very easy for kids to read. Another wonderful thing is the Building Block Verse. The Building Block Verse is a memory verse relating to that scene that's been created with Legos. If you have a kiddo that loves Legos or know someone who does then this is the Bible for them. This would be an absolutely terrific gift to give this holiday season! You can find Faith Builders Bible by Zondervan on Zondervan, Amazon, Barnes and Noble and other bookstores.